When it comes to straight forward 2 channel interfaces without MIDI, the Scarlett 2i2 deserves to be at the top of your shopping list. Designed by British company Focusrite and manufactured in China to their exacting standards, this sturdy little aluminium casing houses a top-notch piece of equipment while saving on production costs, and Focusrite pass the savings on to you. You can plug in either 1/4-inch or XLR jacks and both channels come with Phantom Power, with both inputs being switchable between Line and Instrument level inputs. It is well suited to portable use because not only is it built tough, it also uses the power supplied by its USB 2.0 connection so you don't need a power adapter - just plug it straight into your PC or laptop and you're ready to go. 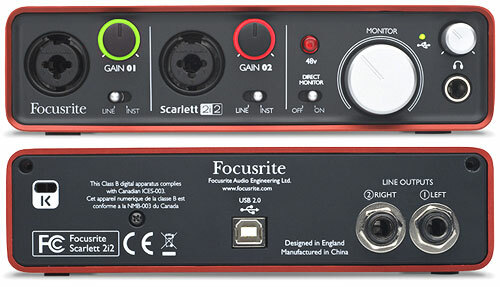 The Scarlett 2i2's 24-bit / 96kHz capabilities mean it can be used for professional recording on the go, and Focusrite are renowned for the quality of their A/D converter designs. It comes with a free fully functional version of Ableton Live Lite included along with a free plug-in bundle and a sample pack from Loopmasters to add to the samples and instruments provided by Ableton Live. It's highly portable and can go wherever you and your laptop go. When plugging in a mic with an XLR connection it automatically sets the input impedance to line level. Great for recording live gigs to your laptop so long as you're taking a signal directly from the mixing console which has already passed through a limiter/compressor. Compatible with Windows XP SP3 or later, and Mac OS X 10.6.5 or later. The lack of MIDI means it's not suitable for some home studio setups. With no limiter/compressor you won't want to record anything with a wide dynamic range, but at least it does have lights around the gain knobs on the front panel to indicate if clipping is occurring. I've seen one report that a color blind person with a red/green deficiency couldn't tell if the input audio was clipping.